[127 Pages Report] MarketsandMarkets estimates the Video on Demand in Hospitality Market to grow from USD 6.89 Billion in 2016 to USD 19.11 Billion by 2021, at a CAGR of 22.6% during 2016-2021. The base year considered for the study is 2015 and the market size has been projected from 2016 to 2021. 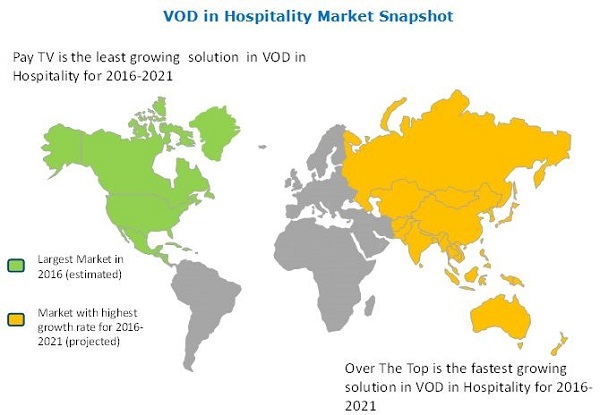 The report covers the hospitality market and usage of VOD solutions in it. This report provides brief introduction of VOD solutions and the current trends of using them in the hospitality market. The objective of this market study includes analysis of each subsegments with respect to individual growth trends and contribution towards the overall market. Another objective of the study is to forecast market size of each and every segment with respect to the five major regions. Major players in the VOD ecosystem were identified across regions, their offerings, and distribution channels; the regional presence has been studied through in-depth discussions. The average revenue generated by these companies segmented by region was used to arrive at the overall VOD market size. This overall Video on Demand in Hospitality Market size is used in the top-down procedure to estimate the sizes of other individual markets via percentage splits from secondary and primary research. All percentage splits and breakdowns were determined using secondary sources and verified through primary sources. All possible parameters that affect the market covered in this research study have been verified through primary research, and analyzed from the market knowledge. The breakdown of profiles of primary is depicted in the below figure. The ecosystem of the Video on Demand in Hospitality Market consists of video on demand solution providers such as Cisco, Netflix, and Huawei, video on demand platform providers such as Akamai, internet service providers such as Alcatel Lucent, and cloud service provider such as Google and Microsoft. The video on demand solution providers deliver their solutions to customers as per the need, which are later on assisted by service providers for implementation of solutions properly. Other players such as internet service providers like Vodafone also plays important role by providing strong network connections. The report segments the Video on Demand in Hospitality Market on the following basis. The Video on Demand in Hospitality Marketis estimated to grow from USD 6.89 Billion in 2016 to USD 19.11 Billion by 2021. The VOD in hospitality market is expected to grow at an impressive Compound Annual Growth Rate (CAGR) of 22.6% because of the rising usage of VOD solution for streaming video anytime. The VOD has provided many advantages to users such as ability to skip advertisements, access to episodes anytime, and ability to watch events and shows with flexibility in time. The online video streaming has also increased the viewership up to 60%, which includes young individuals. In solutions, IPTV is expected to have the significant market growth rate and dominate the Video on Demand in Hospitality Market from 2016 to 2021. It provides various services such as high speed internet access and on demand TV shows. Due to these rising usage of IPTV, many hospitality segments such as cruise and luxury hotels have started adopting IPTV for enriching guest viewing experience. Moreover, in service segment, professional services are growing at a faster rate. Training and support services are already been adopted by customers at the time of implementing VOD solutions, so professional services such as managed services are being demanded by customers for proper and continuous usage of VOD solutions. Smartphones and tablets are the widely used delivery models for streaming on-demand videos. This delivery model allows users to watch movie, stream other videos, browsing, gaming, and entertainment. In hospitality segments such as hotels and cruises, usually people carry their own smartphones; so many hotels have started offering internet connectivity services to allow their guest to stream videos on their smart devices. The VOD solution and services are being increasingly adopted in various hospitality segments, such as hotels, cruises, day care centers, and restaurants, which have led to the growth of the market globally. The cruise and luxury yachts sector is expected to grow at the highest rate from 2016 to 2021. North America is expected to hold the largest market share and dominate the Video on Demand in Hospitality Market from 2016 to 2021. The higher adoption rate is expected due to the rise in demand for entertainment technologies in hospitality sector in North America. APAC offers potential growth opportunities, as there is a rise in cloud technology and digital technology adoption among small and large businesses of hospitality sector for increasing their profitability. However, the high cost of VOD solutions restricts the market growth. These solutions involve cost of maintenance and timely upgradations, which adds cost to the organization budget. Moreover, these VOD solutions need better network connectivity to stream HD videos that must be compatible with the devices. Thus, this hinders the adoption of VOD solutions across various hospitality segments. The major vendors in the Video on Demand in Hospitality Market includes Alcatel-lucent(France), Ericsson(Sweden),Huawei (China), AT&T (U.S.), Cisco (U.S.), Apple(U.S.), Microsoft (U.S.), Akamai (U.S.), Avaya (U.S.), and Netflix (U.S.). Alcatel-lucent is one of the major players in this market. This player has adopted various strategies such as new product launches, to cater to the needs of the VOD users. This can be witnessed with the recent launch of Akamai’s Predictive Content Delivery Solutions to allow instant HD quality video distribution on mobile devices. This solution also manages offline video on any device over any network. 13.1.3 Huawei Technologies Co, Ltd.